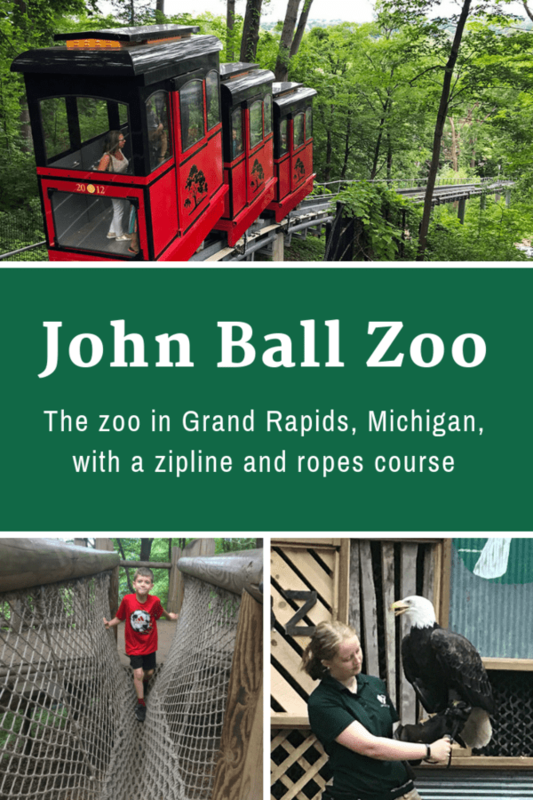 We visited one zoo during our great Michigan Road Trip – the John Ball Zoo in Grand Rapids. It was a great zoo for animal interaction and adrenaline adventure (for an added fee). I wouldn’t typically say zoos have adventure (well, there was that one time in Florida), but this place was a blast. Disclosure: Our visit was hosted by Experience Grand Rapids, though the add-on experiences were at not complimentary. All thoughts, opinions and typos are my own. The zoo is in a pretty setting, wooded with plenty of shade. It’s smallish, so families can visit for the afternoon and not be exhausted afterward. A waterfall at the John Ball Zoo in Grand Rapids, Mich.
My caveat: I’m pretty spoiled with the Omaha zoo, so I didn’t seek out a lot of the animal exhibits. Instead, I sought unique zoo experiences I can’t find in Omaha. My kids’ favorite part of the zoo, and, fine, MY favorite part, was the Realm of Flight Bird Show. It was only $2 extra per person and worth it. If you visit on a weekday, it is free. 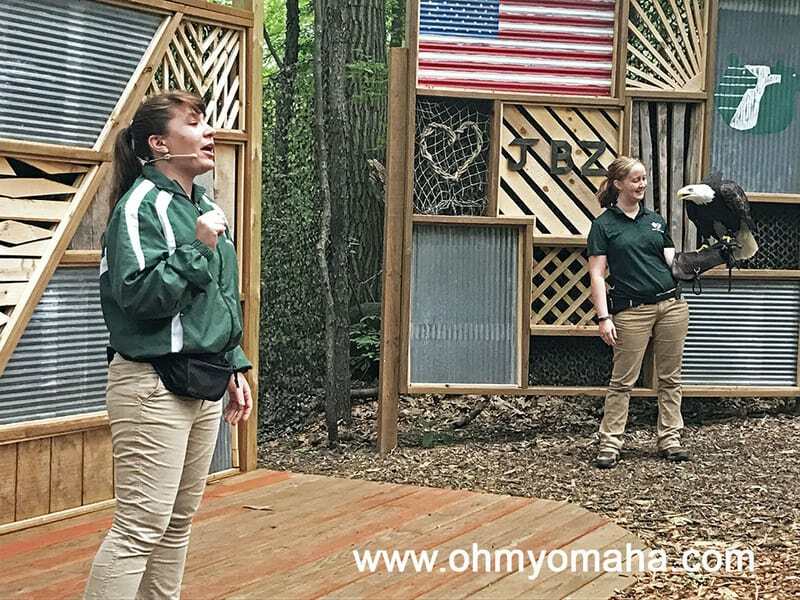 The audience learned about 10 birds through demonstrations during the Realm of Flight Bird Show at the John Ball Zoo. As part of the show, keepers introduced different species and we watched them in flight. Some were trained to do tricks, which delighted kids. Adult volunteers were included in the show, too, and I was called up to play the part. No bird landed on me, I just had to place a can on a side table. At the end, families could get their pictures taken beside the bald eagle and donate money to the zoo by handing a macaw a dollar bill. Until recently when the Venture Parks exhibits opened, there were no ropes courses in Nebraska, so I’m all for trying them out on vacation. 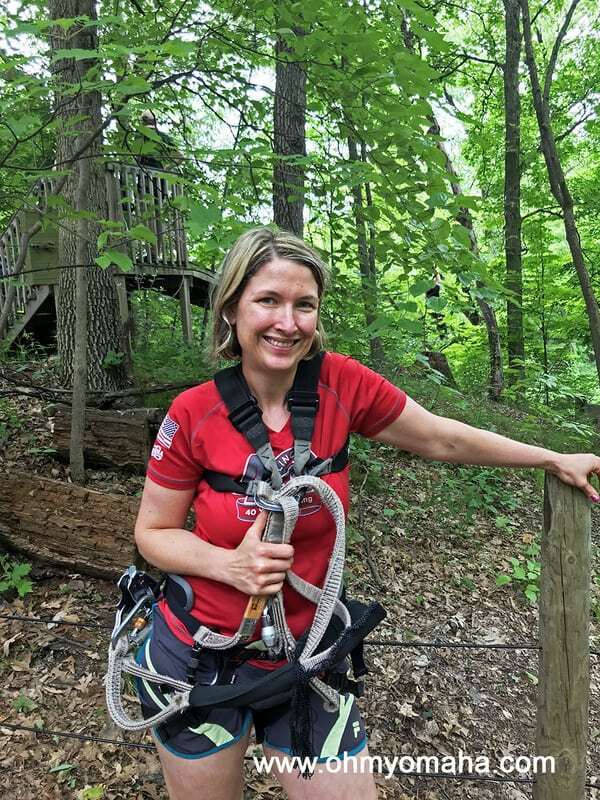 In Grand Rapids, the zoo has a pretty stellar, four-story ropes course for families. 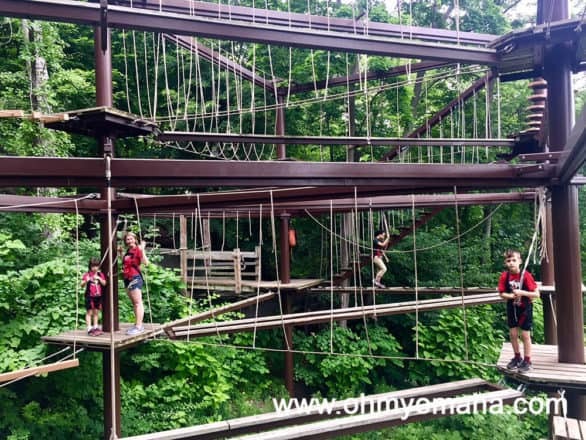 My 8-year-old managed the ropes course with ease but my youngest child was nervous. It is a big extra cost to do it, but if you’re an adventure-loving family, how can you not? It’s a course in a pretty space in the zoo, treetops and greenery. Kids need to be at minimum age and weight to do it. My daughter was all talk about it, but then when we got out on the course, she froze up. Be extra sure your kiddos are ready for it before spending the money to take them on it. Following the nervousness my youngest had on the ropes course, I figured I should just do the zipline alone. All set to zipline through the zoo. It’s pretty tame for a zipline course—just two lines and not too fast—but the cool thing is that they go right through the zoo. 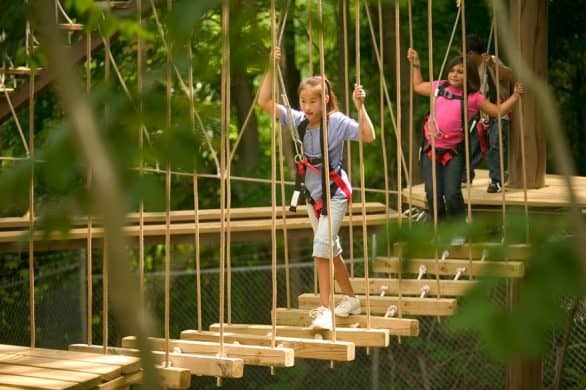 You can buy combo tickets to save money on both the ropes course and ziplines. We tried a few other add-ons, including the Budgie Aviary, where for $1 you feed birds with a stick dipped in peanut butter and covered in seed. Feeding a budgie, or parakeet, at the Grand Rapids zoo. There’s also a funicular ride in the zoo. For $3, it takes you the highest point in the zoo – saving you the walk up the hill. 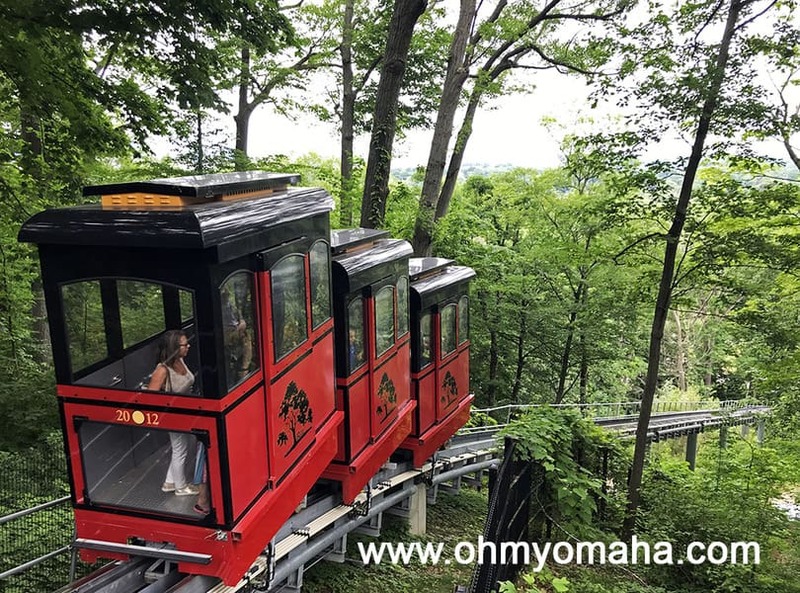 The funicular at John Ball Zoo takes passengers to the highest point in the zoo, making it an all-downhill walk from there. So, you’re probably wondering about animals exhibits. We stuck to a lot of hands-on things on this trip. However, one of the more unique exhibits to check out is the Wild Way Trail. 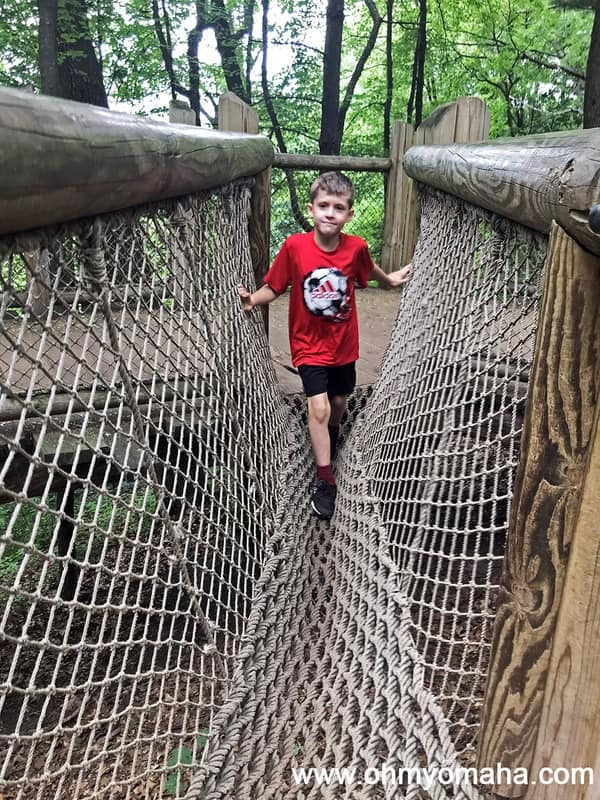 It’s a trail with animal exhibits dependent on weather, but the neat thing is that it incorporates ways for kids to try to move like the animals (climbing and crawling, for example). There a wallabies, lemurs, parrots and howler monkeys along this wooded path. Playing in the TreeTops Outpost at the John Ball Zoo. There are also fun play areas. One’s a natural play area where kids can get their hands dirty playing with sticks and stuff. The other, the TreeTops Outpost, is more about climbing and feeling adventurous. My kids loved it. Grand Rapids was the first stop of an epic road trip adventure through Michigan (more on that to come). To plan your own epic road trip through Michigan, I’ll be sharing a road trip recap soon featuring restaurant highlights, sights to see, and where to stay. You can start planning now with this ultimate Michigan Bucket List. 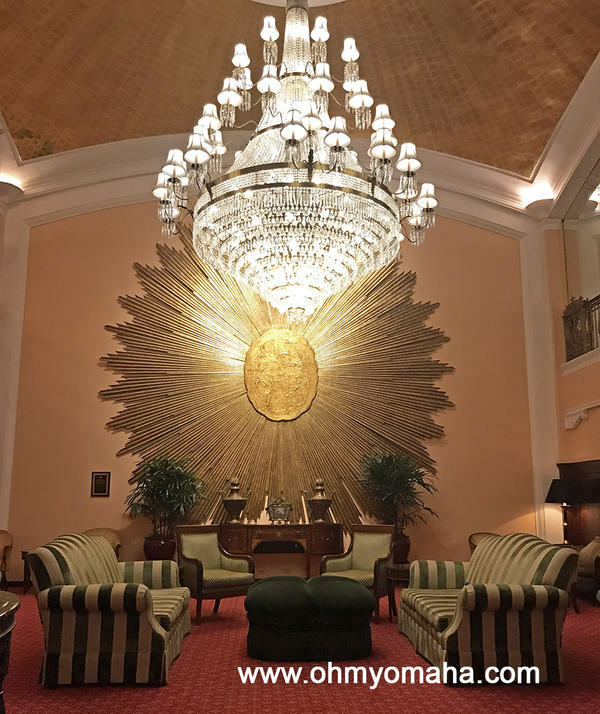 The Amway Grand Plaza is more than a century old and credited for revitalizing downtown Grand Rapids, Mich. Grand Rapids was our first stop on our epic road trip through Michigan. I had a lot of plans, and luckily, Amway Grand Plaza was centrally located for our adventures in the city. Disclosure: Our visit was hosted by Experience Grand Rapids. All opinions, thoughts and typos are my own. Amway Grand Plaza has two sides to it: There’s a grand historic side and then there’s the modern luxury side. It really does feel like two separate hotels, where one tower (the tall, glass one) has modern amenities like the pool, outdoor tennis courts on the roof, and a restaurant by Wolfgang Puck. And on the other side (the historic hotel side), there are chandeliers, upholstered furniture, a fountain and dim lights. The Amway Grand Plaza in Grand Rapids was once the Pantlind Hotel, and its historic lobby has maintained the early 20th century charm. 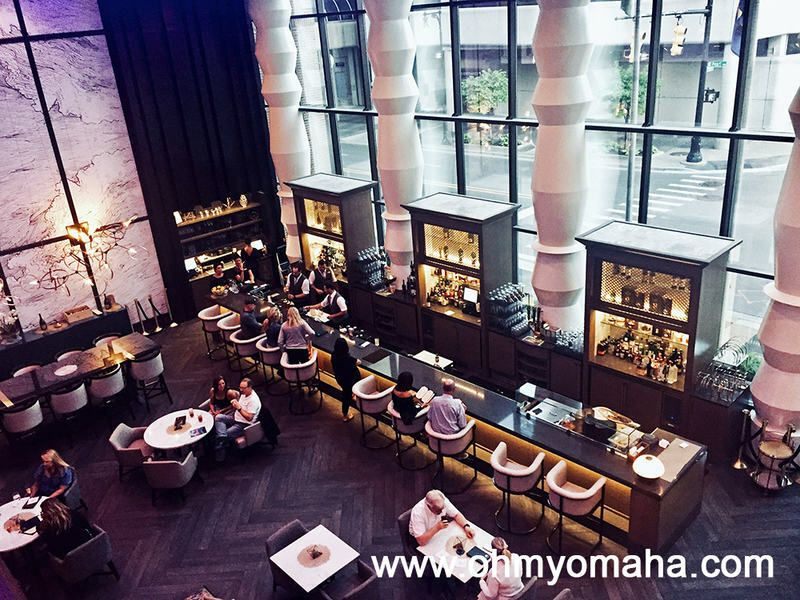 When you check in, the lobby is modern, bustling and connecting the two sides. I mention this because I was envisioning entering the building and stepping back in time. Instead, I asked if I was in the right place. Walk away from the modern lobby and you’ll step into the gorgeous lobby on the historic side. It’s dimly lit by grand chandeliers, and the centerpiece is a fountain. The historic lobby of the Amway Grand Plaza Hotel had a fountain my daughter liked to watch. There are options for rooms, and if it’s in the budget, you can opt for larger suites. We stayed in a room with two queen beds, which worked for our family of four. Understand that a room like that may feel small by modern standards. A room in the historic Amway Grand Plaza was a little small by modern standards but was just fine for a family of four. The decor was beautiful and fit the historic nature of the hotel. The bathroom, though, is updated and modern. One thing to note: If you’re staying on the historic side, and you’re traveling with kids, a pool visit is inevitable. Know that you’ll have to cross through the lobby and take a lengthy walk to the other tower. Bring a cover-up. It’s understandable to even wonder if this would be a good hotel for families given the historic nature of the hotel. It definitely is. We saw many families passing through the lobby while we were there, and the pool was a happening place each night. 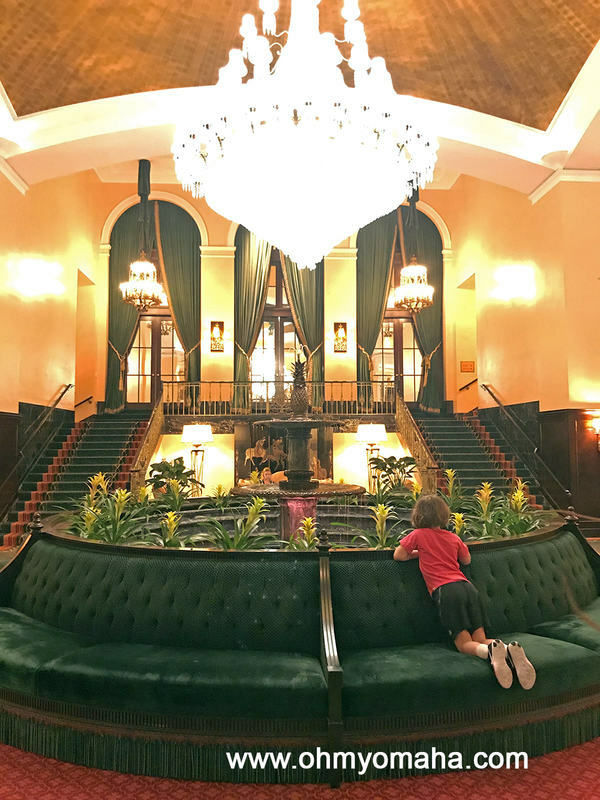 Related Post: Favorite Historic Hotels For Families In The U.S.
My kids loved the pool area, of course, and I enjoyed the hot tub. There are two hot tubs, usually, though one was closed while we were there. The pool and one of the hot tubs at the Amway Grand Plaza in downtown Grand Rapids. If the weather had been nicer (and if I knew how to play), we’d take advantage of playing tennis there. How often do you get to play on a roof? There were other lawn games out there, too, like corn hole and that ladder golf game. I couldn’t get my kids out of the pool or we would’ve tested them out. Adults will like that the fitness center also has locker rooms where the men can sit in the steam room and the women can enjoy the sauna. As far as the rest of the hotel, both kids were fascinated by the Pantlind lobby, and wanted to take more photos than me. And just try to find me a little kid who isn’t fascinated by a fountain in a lobby. The hotel has several restaurants ranging from Ruth’s Chris Steakhouse to a Starbucks. We didn’t eat at any of them, though my daughter and I did peek at the breakfast buffet at Rendezvous. It was very tempting but a little out of my price range for breakfast. Rendezvous is a bar in the evening, but come morning, it’s a family-friendly place for breakfast. It’s located in the main lobby of the Amway Grand Plaza in downtown Grand Rapids. If you want to know where we had breakfast during our stay, read this post about our weekend in Grand Rapids. One of the prime reasons to stay at this hotel is its location. It’s in a prime spot in downtown Grand Rapids, right near the river. The view of downtown Grand Rapids, Mich., from the Grand Rapids Public Museum. Two of the places we visited, Grand Rapids Children’s Museum and the Grand Rapids Public Museum, are about a half-mile from the hotel. 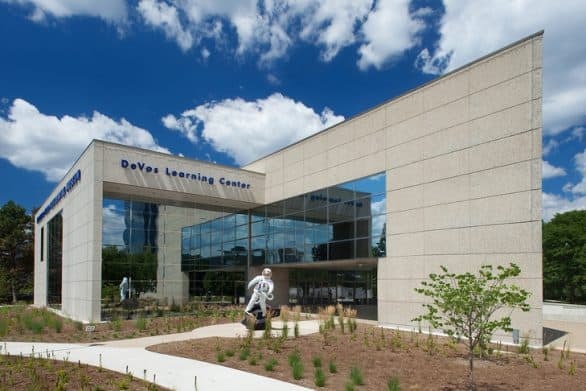 It’s also near the Grand Rapids Art Museum and the Gerald R. Ford Presidential Museum. Read about all the things you can do in Grand Rapids in the post 48 Hours In Grand Rapids With Kids. It’s also near great restaurants and breweries. Parking is expensive in downtown Grand Rapids, and while you can self-park at the hotel, note that that is also expensive ($29 a night). Grand Rapids was the first stop of an epic road trip adventure through Michigan (more on that to come). 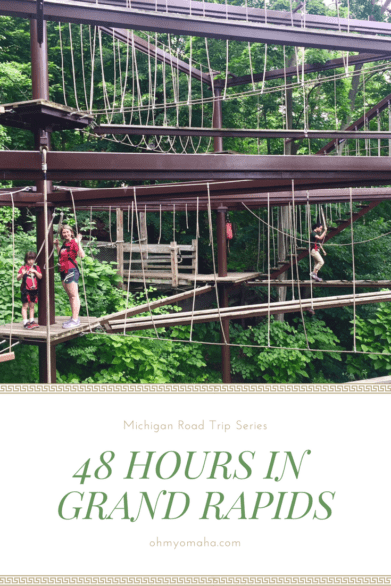 To plan your own epic road trip through Michigan, check out this Michigan road trip recap featuring restaurant highlights, sights to see, and where to stay. Grand Rapids, Mich., is the sort of city that surprises you. Or at least it surprised me – and that’s saying something given how much thought I put into planning a family-friendly 48-hour visit this summer. 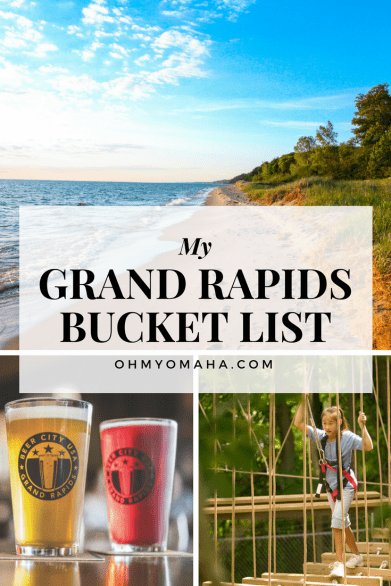 Check out my Grand Rapids bucket list to see just how much I thought about things. 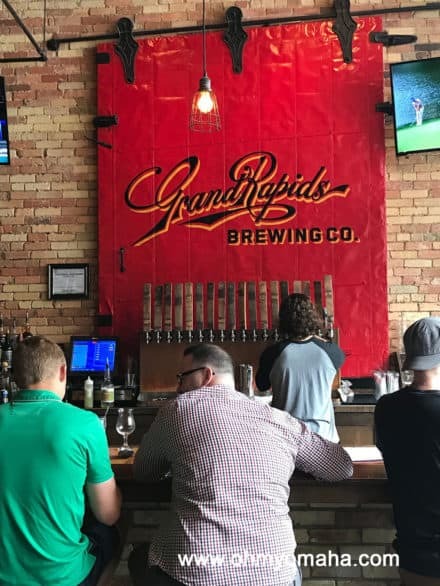 I thought I knew what to expect (ie., it’s Beer City USA and family-friendly), but Grand Rapids exceeded my expectations. The biggest surprise of the trip was the Grand Rapids Public Museum. This museum far exceeded my expectations on things to do and see inside. We squeezed a visit at the end of the day, which meant we had allowed very little time here. However, we did manage to explore most of the three floors of exhibitions. 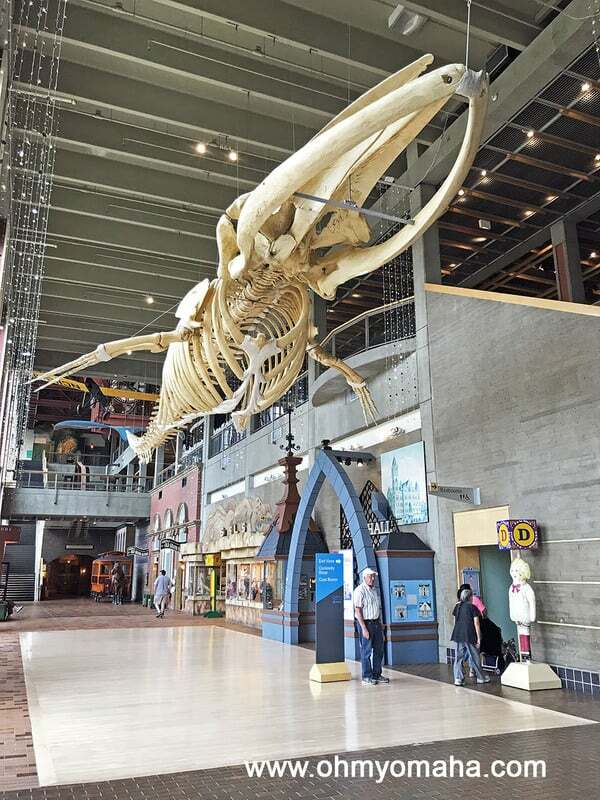 The highlights were Finny, the 75-foot-long fin whale fossil; “Streets of Old Grand Rapids,” a scaled-down version of a 1980s Grand Rapids street; and the carousel. Both adults and kids loved this museum. 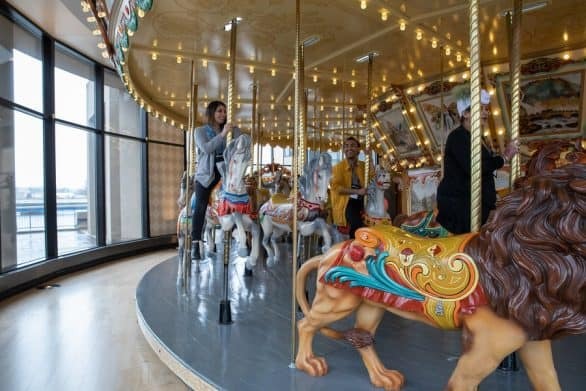 The carousel is an additional fee. 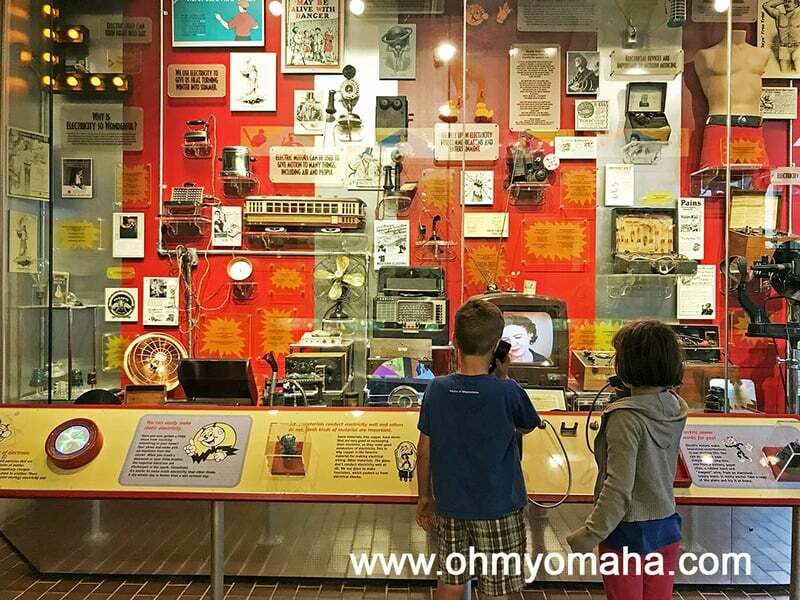 Note: If you have a family membership to Omaha Children’s Museum, two adults and dependent children are admitted for FREE to the Grand Rapids Public Museum thanks to the ASTC reciprocal program. The John Ball Zoo was another surprise, and I’d almost left it off our visit list because we’re at our own zoo so much. Don’t skip it. It’s a beautiful zoo, with a lot of trees to provide shade and fun things for kids to do (in addition to seeing animals). My kids couldn’t wait to get their photo with the bald eagle once the Realm of Flight Bird Show was over. The highlights were the extras, admittedly. I go into more detail about more extras here. The Realm of Flight Bird Show was definitely worth paying $2 per person extra. It was very entertaining, educational, an interactive. And when they say the birds will fly inches from your head, they mean it. The other two extras we purchased was the ropes course for all four of us, and a zip line for me. The ropes course is 20 minutes long, and great for older kids (my youngest was tall enough and insisted on going, but she quickly decided she didn’t like it). The zip line is two zips (is that what it’s called?). You zip through the zoo, and though it’s not too steep and not too fast, I still managed to stumble at each podium coming in for a landing. My whole family did the ropes course at John Ball Zoo in Grand Rapids, Mich. If you have young children, the Grand Rapids Children’s Museum is going to be a hit. The highlight would be the bubble area and the mini version of Grand Rapids complete with a grocery store. I thought the mini medical area was pretty special too. 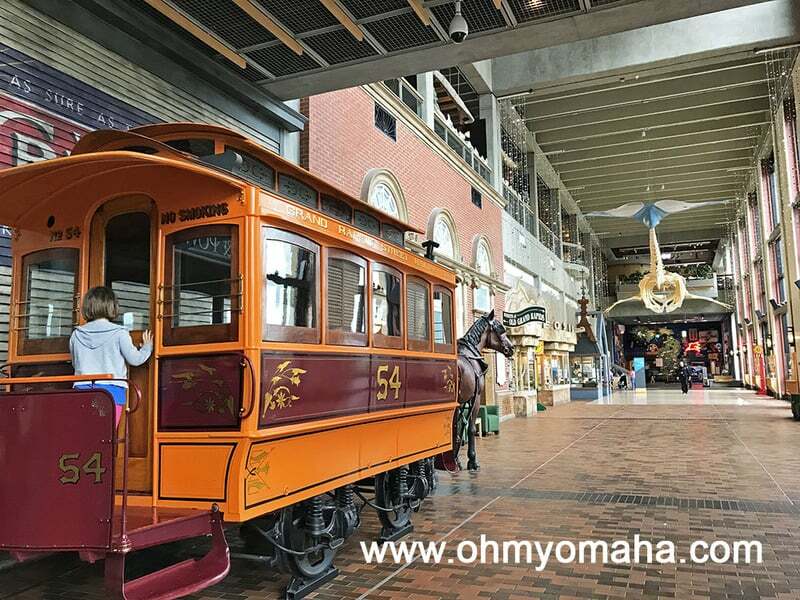 Note: If you have an Omaha Children’s Museum patron membership, you receive admission for four to the Grand Rapids Children’s Museum thanks to the ACM reciprocal program. The Patron Membership is more than the regular membership, which does not include the ACM reciprocal program. More details here. 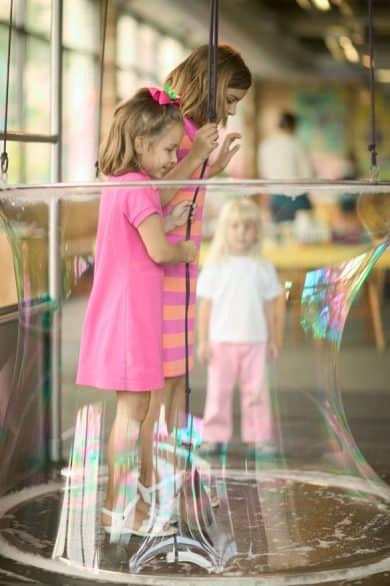 There’s not resisting bubbles at a children’s museum. The Grand Rapids Children’s Museum even has an area where you can stand in one. The last place we managed to visit in our quick visit was Millennium Park. Had it been a warmer day, we would’ve paid a little extra to go to the beach area. As it was, we did the free version of the park, and played on the playground and took a little walk. If we had more time, we would’ve rented kayaks to explore the lake. 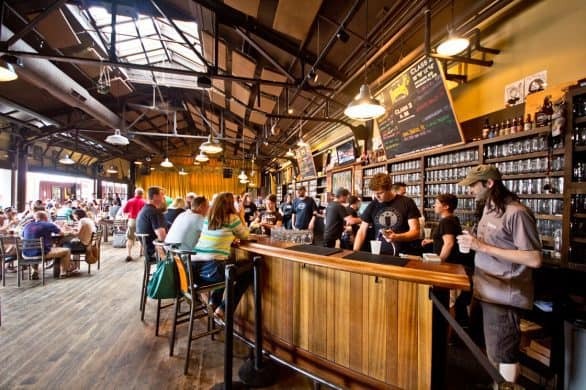 Many of the city’s museums and popular restaurants & breweries are near downtown Grand Rapids. One of the best situated downtown hotels also happens to be a gorgeous historic landmark, the Amway Grand Plaza. The historic lobby of the Amway Grand Plaza had a fountain my daughter liked to watch. This hotel put us in walking distance to the Grand Rapids Children’s Museum and Grand Rapids Public Museum. 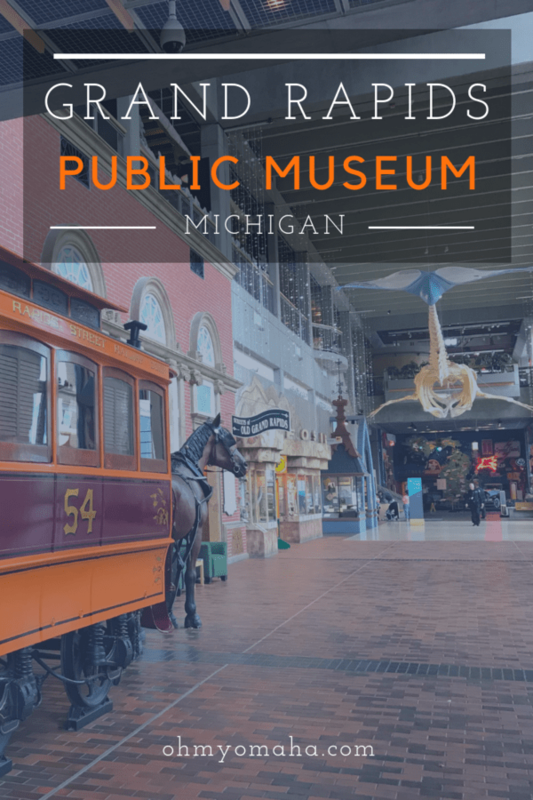 If we had stayed an additional day or two, other museums within walking distance include the Grand Rapids Art Museum and the Gerald R. Ford Presidential Museum. It was also within walking distance to one of our dinner spots, the Grand Rapids Brewing Co. The Amway Grand Plaza is a luxury hotel, but not too nice that we couldn’t traipse through the lobby in pool attire. That was one of the down sides of our stay: Our room was on the historic side of the hotel, the pool and hot tubs was on the fourth floor of the newer tower. Didn’t stop us from making several trips to swim. And for the active families: The fitness area also includes a fitness center, and outdoor tennis courts. 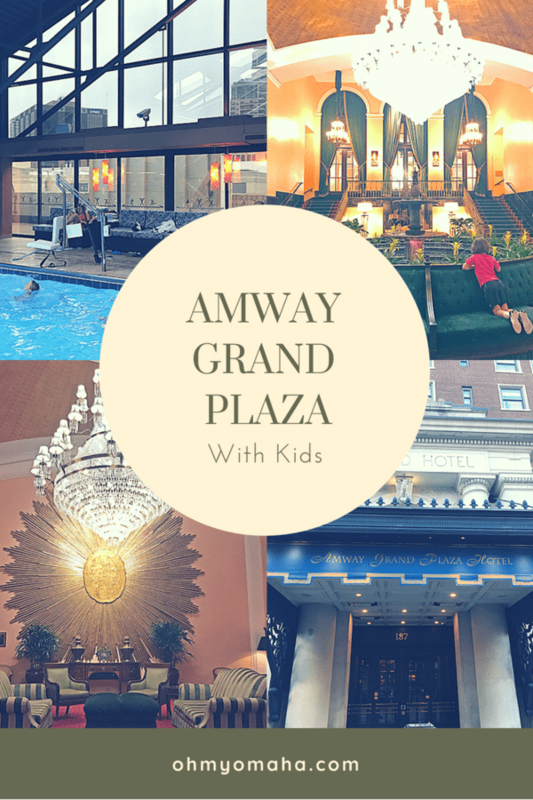 Related post: Staying at Amway Grand Hotel With Kids. Breakfast – We dined at one of the locations of the local chain Anna’s House. It was so, so good. And efficient. There was quite a wait, but we were seated in under 20 minutes, and the food was to our table in a snap. The menu is large and it’s difficult to decide whether to eat the red velvet pancakes or the healthy hippie hash. Guess what I chose. Dinner – Grand Rapids is known as Beer City U.S.A. and several people had tips on which breweries were family-friendly (ie., menus for kids and/or toys & activities for them). We opted for Grand Rapids Brewing Co. since it was so darn close to the hotel. The beer was very good, the saison especially. And, they adapted adult sized entrees to the kids’ tastes, like removing the extra accoutrement on the mac and cheese. Grand Rapids Brewing Co. was pretty family-friendly and located within walking distance of our hotel in downtown Grand Rapids. I ordered the 2016 Grandwich Champion and Food Network darling, 1-800-Hotline Beef. It was a roast beef sandwich to end all other roast beef sandwiches, and the fries weren’t too shabby, either. Chez Olga was in Eastown in Grand Rapids. The restaurant serve Caribbean food. We also went to Chez Olga for dinner in the utterly charming Eastown neighborhood (I read it’s described as the Greenwich Village of Grand Rapids). Admittedly, the wildly unique building is what first attracted me to the Caribbean restaurant. But the food was superb, too, and Olga was a friendly hostess. Grand Rapids, Mich., has been on my radar for some time because of it’s thriving craft beer scene (it’s not called Beer City USA for nothin’). But as a mom planning a family vacation to the city this summer, my dream itinerary for the Grand Rapids has changed (though I will be ordering local beer when I’m there). This is the first stop in an epic Michigan road trip – and you bet there is a Michigan Bucket List for it. Eat all the food – If you’ve read any of my bucket lists, you know food plays a big part. And Grand Rapids has an amazing food scene. I wish I could eat at all the places that caught my eye: The Electric Cheetah (which I found on this great Grand Rapids foodie list); Licari’s Sicilian Pizza Kitchen (which apparently was recognized as the state’s best pizza at one point and they rubbed elbows with my man, Bobby Flay). And here’s a burger for all to try: The peanut butter and jelly burger at Grand Rapids Brewing Co. (at least one person says it’s one of the state’s best). 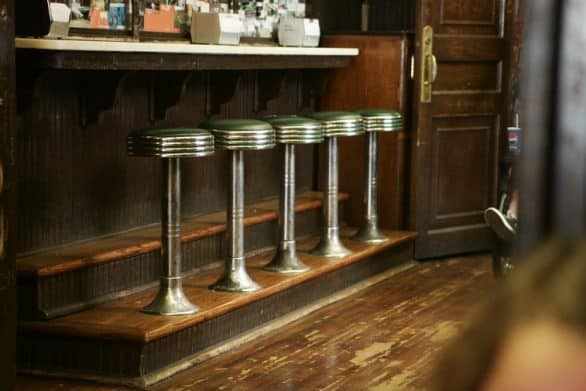 Go old-school with lunch – Yesterdog is a Grand Rapids institution since 1976 serving up tasty hot dogs in what sounds to me like a very eclectic, quirky setting. The classic Yesterdog is topped with chili, onion, mustard, pickles and ketchup. See why it’s called Beer City – I love sampling local brews while on vacation, but going to a brewery can be dicey with kids. There are more than 40 local brewers in Grand Rapids (hence the name Beer City, USA), and luckily, I stumbled across this list of family-friendly breweries in Grand Rapids! Both Founders Brewing Co. and Harmony Brewing Co. sound like places spacious enough, and friendly enough (Harmony haves books and games), for us to visit while on vacation. Founders has been ranked among the best IN THE WORLD. By the way, there are a TON of brewery tours in Grand Rapids. Look over this list of tours at Experience Grand Rapids. Brewery tours aren’t something I’d do with my kids, but I’m putting it on your radar in case you’re traveling without kids. Eat Somewhere Special – I’d love to try the The Cellar Private Chef’s Table Experience at Noto’s Old World Italian Dining, with farm-to-table Italian food paired with Italian wines. Yum. I fully admit this will never happen if we’re vacationing with young kids. However, a mom can dream. 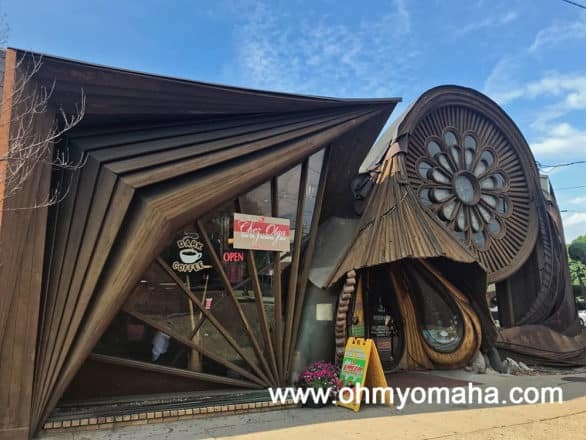 Another restaurant that stands out simply because the building is unforgettable is Chez Olga. I’ve never seen anything like it. And since its Caribbean fare was recommended on Chowhound, I kinda really want to dine there. Update: We made it to Chez Olga! See the enchanting exterior of the restaurant in this family-friendly Grand Rapids itinerary post. Lena Meijer Children’s Garden (located in Frederik Meijer Gardens & Sculpture Park) – No doubt my kids will never want to leave this space. 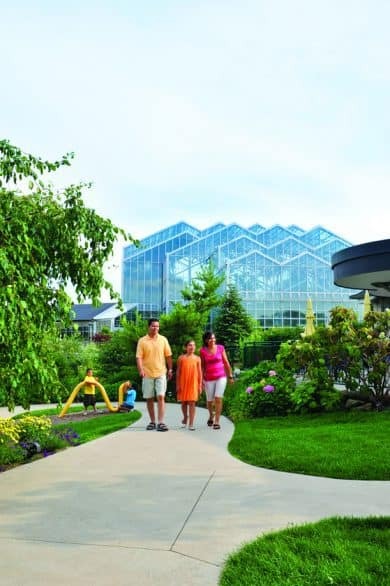 I think the Great Lakes Garden alone will keep my kids entertained for an hour, but then there’s also the Rock Quarry and Treehouse Village and so many other things to see there. Obviously, beyond the children’s garden, there would be a ton more to see. Happy Cat Yoga – Yoga with cats is a thing, and I’ve found it in Grand Rapids at the Happy Cat Cafe (the city’s first cat cafe). I don’t think I can get my husband on board with taking the whole family to it (and it probably isn’t even going on while we’re there), but a cat lover can dream. 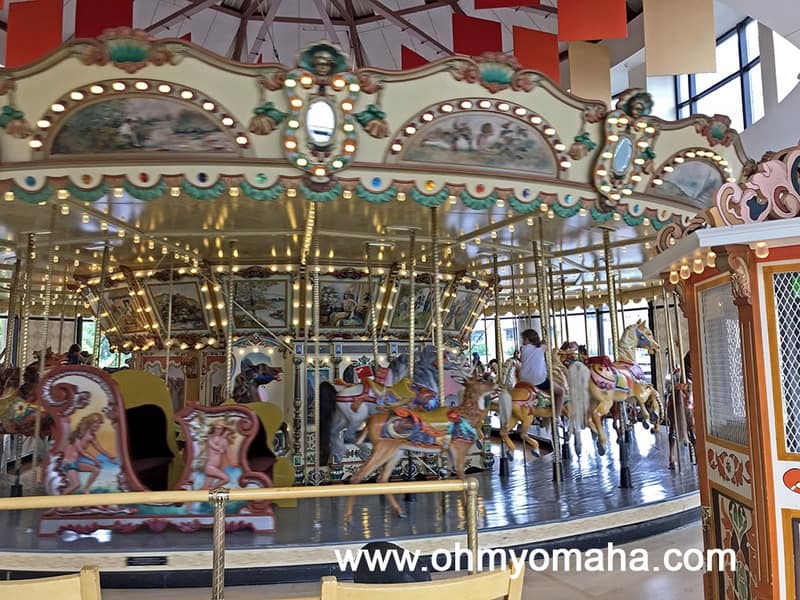 Grand Rapids Public Museum – The 1928 Spillman Carousel is reason enough to bring my kids here, but the entire museum looks pretty interesting. There are three stories of exhibits to see there. Update: We went to the Grand Rapids Public Museum and, yes, we rode the carousel. However, it was not even close to the coolest thing we saw there. Read my post about this amazing museum here. 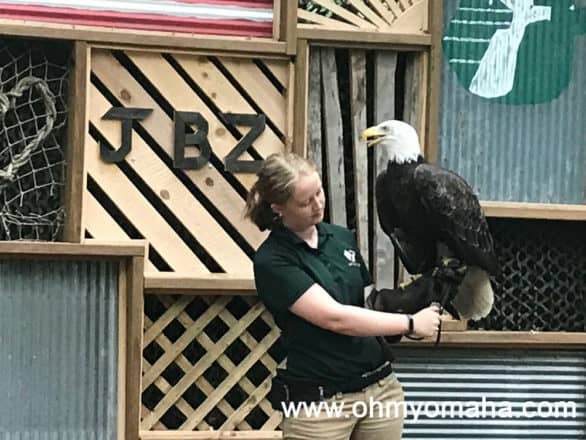 John Ball Park Zoo – This looks like a fun zoo with experiences taking you beyond expectations. My whole family would love doing the zip line or ropes course, or have a ride on the funicular. 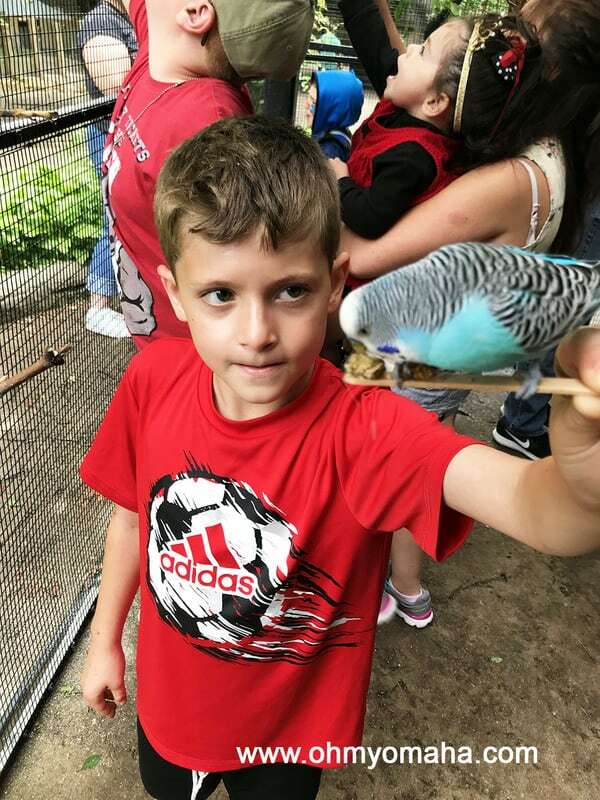 There are animal encounters, too, that would be a hit, especially for my bird-loving youngest, like feeding budgies and the Realm of Flight Bird Show. Go on a safari ride at Boulder Ridge Wild Animal Park – Located in nearby Alto, this hands-on wildlife park isn’t quite a zoo, but you can expect to see exotic animals and reptiles. The safari ride is included with admission and the only way to see larger herds of animals. See a show – I love checking theater listings before visiting a new city. The Grand Rapids Civic Theatre has a fantastic lineup, but unfortunately, no shows are on stage while we’re there. We will just miss catching “Shrek The Musical” there! 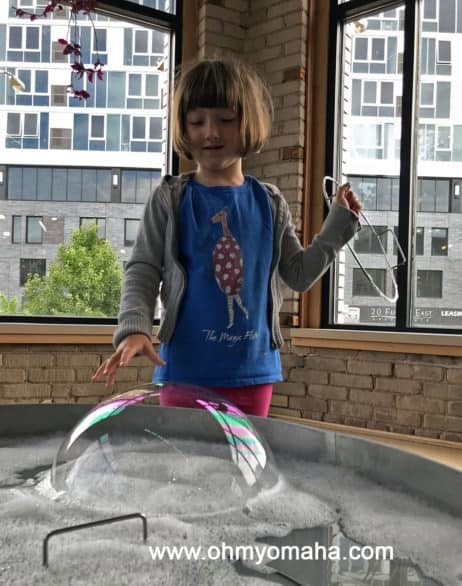 Grand Rapids Children’s Museum – Given my day job, you bet I love visiting children’s museums wherever we go on vacation. My kids do, too! Here’s the Grand Rapids Children’s Museum website. 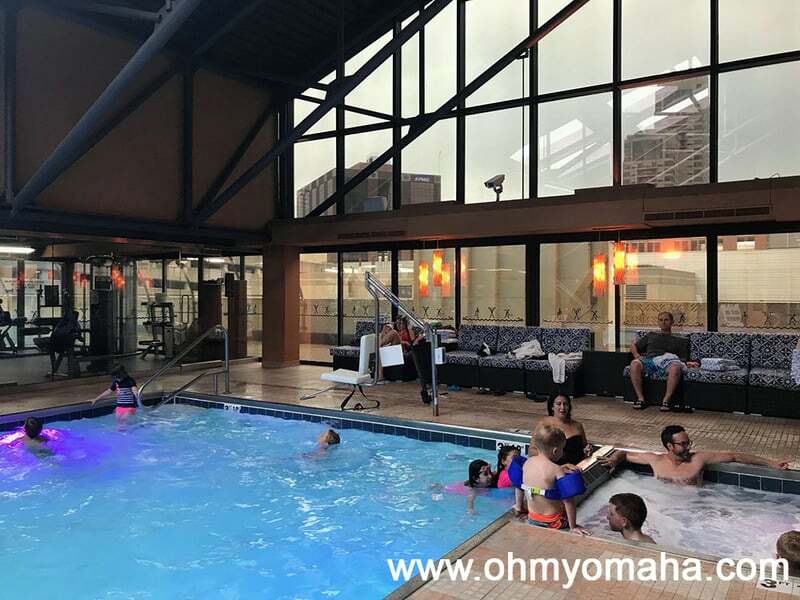 Stay somewhere historic WITH a pool – I love hotels with unique architecture and history, but they often don’t have the amenities that traveling with kids requires (AKA, a pool). But check out the gorgeous Amway Grand Plaza, which has a pool, folks. I also like its location and proximity to a lot of things on this list. My kids are going to love the place. 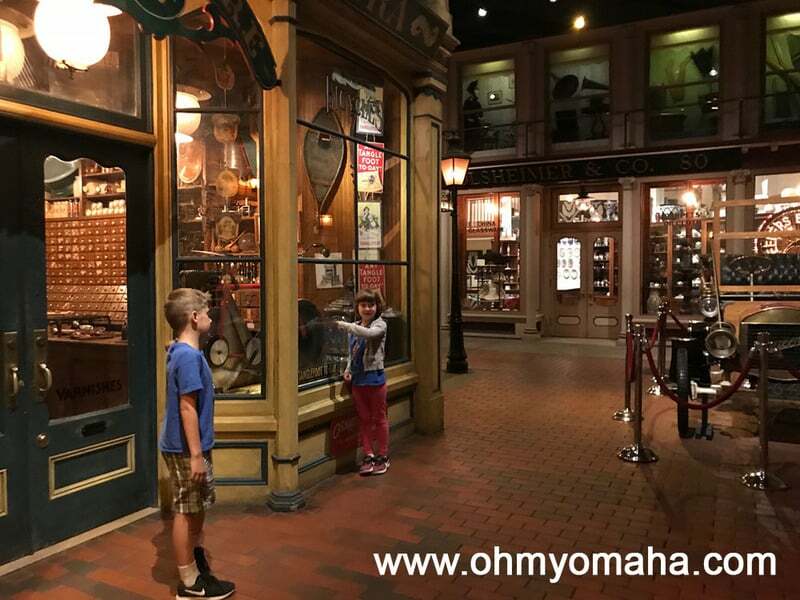 Related post: Staying at the Amway Grand Plaza With Kids. Gerald R. Ford Presidential Museum – I feel like since his birth place is in Omaha, maybe we ought to visit his museum, right? The fascinating Grand Rapids Fish Ladder is within walking distance from Gerald R. Ford Presidential Museum, so maybe I can kill two birds with one stone in that visit. Catch THE festival – Alas, this will have to stay on my bucket list for another visit. You can’t read about Grand Rapids without reading about ArtPrize. This is a huge festival in Grand Rapids starting in September and running for a few weeks – and it’s FREE. Beach! 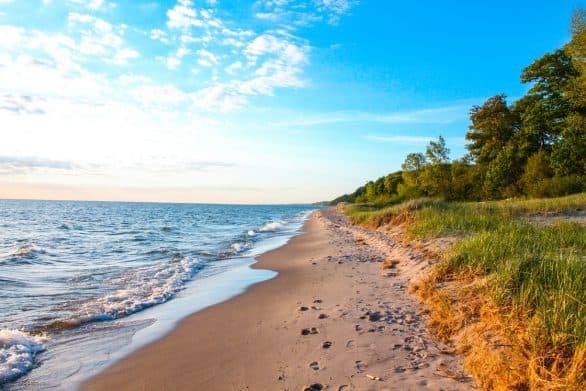 – Grand Rapids is near some gorgeous beaches, including Oval Beach in Saugatuck, which is ranked one of the top 25 beaches in the world by Condé Nast Traveler and one of the top two freshwater beaches in the USA by National Geographic Traveler. A little closer is Millennium Park, which has a beach and a splash pad…say no more. 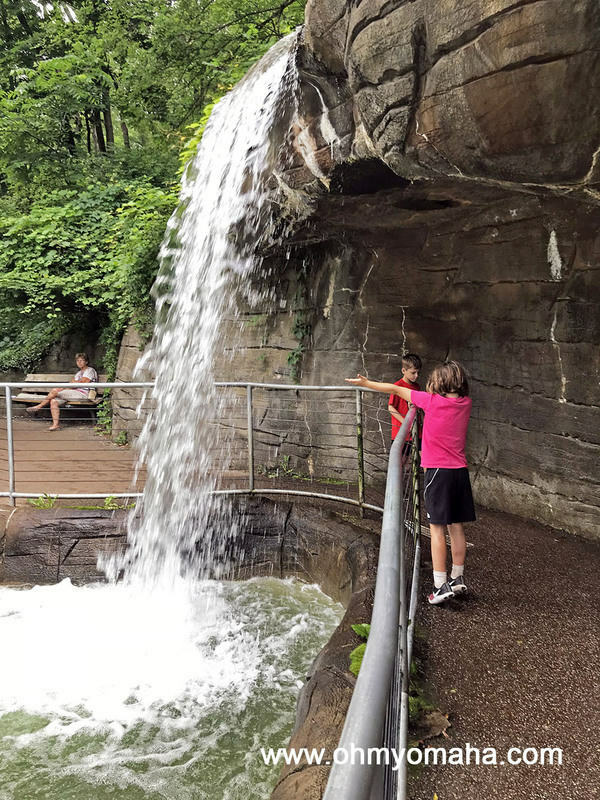 Get out in nature – Looks like there are a variety of places to hike with kids even within the city. The Calvin College Ecosystem Preserve has trails and a butterfly home that would be pretty to see. Another option is the Blandford Nature Center near the zoo. Look for more kid-friendly trails here. Need more ideas? 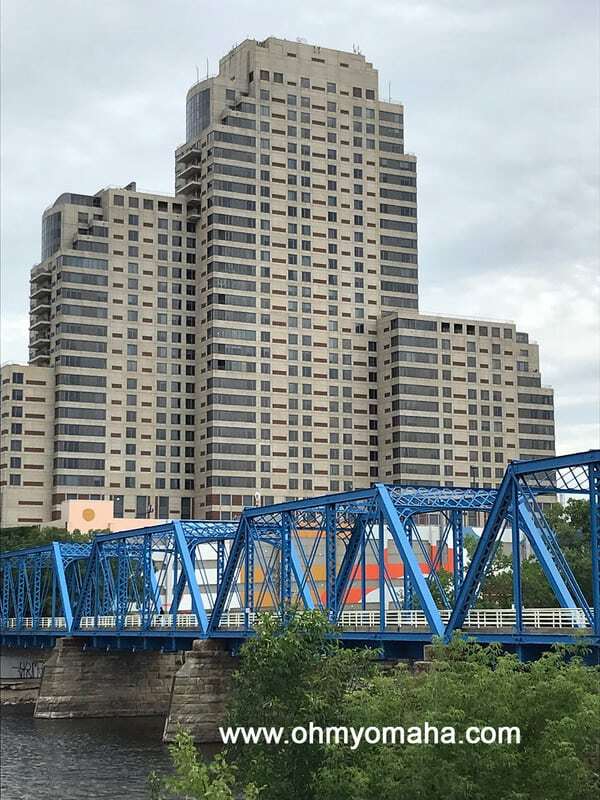 There’s so much more to see in Grand Rapids! Start at Experience Grand Rapids. 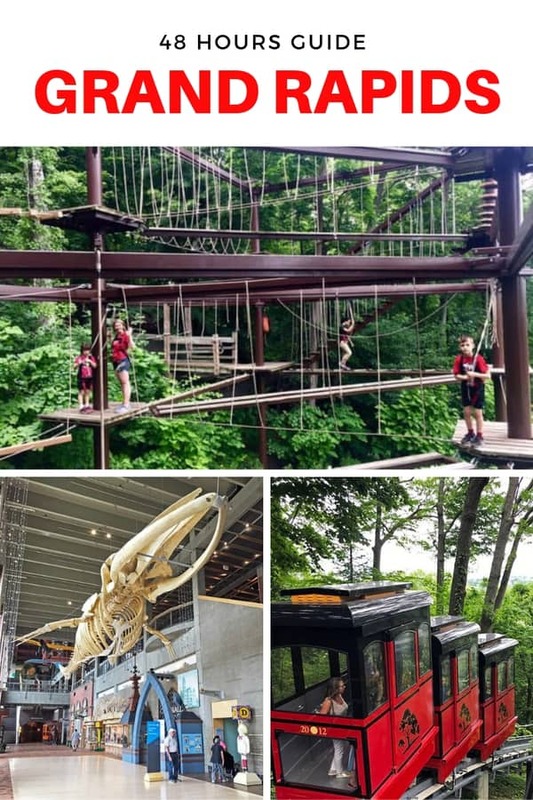 Then read up on our two-day adventure in Grand Rapids turned out – there were ziplines, a ropes course, soaring eagles, and one incredible hotel!